The Doctors Kienle Center for Humanistic Medicine is an endowment that supports projects and initiatives that promote compassion in health care settings. 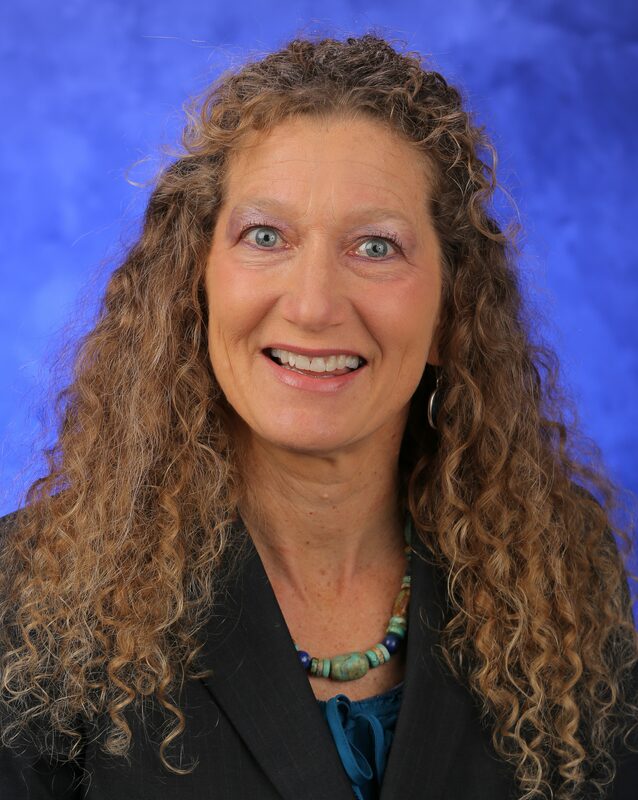 This work has flourished with the support of many departments throughout Penn State Hershey Medical Center and includes ambassadors from throughout the hospital, medical school, and community. 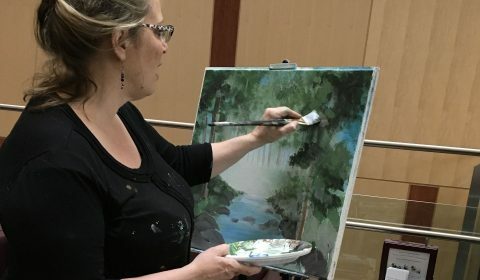 You can learn more about The Doctors Kienle Center for Humanistic Medicine and Center Stage here, and we invite you to find out more about our professional artists by attending one of our Events. Claire de Boer is a member of the governing board of the National Organization for Arts in Health. 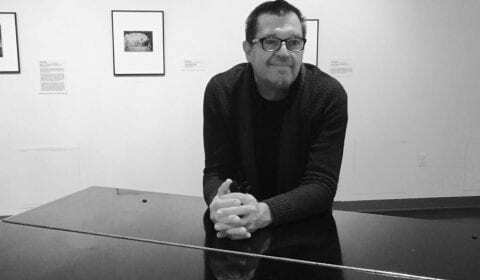 The Department of Humanities and Center Stage arts in health are founding members. Explore our programs by clicking on the links below. 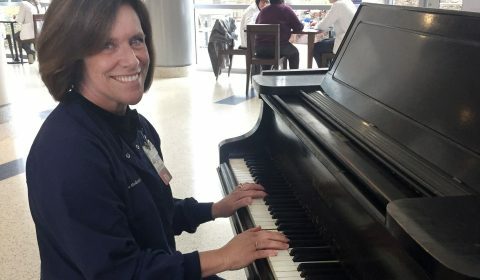 Professional musicians of a variety of genres and instruments play cheerful and reflective music in numerous clinical and family areas. Vetted pianists play soothing and uplifting melodies on the pianos in our main entrance lobby and surgical wait area. 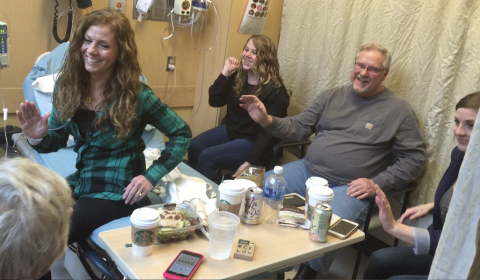 Center Stage staff visits patients when they are admitted to the hospital. Staff offers a portfolio of work by regional artists. 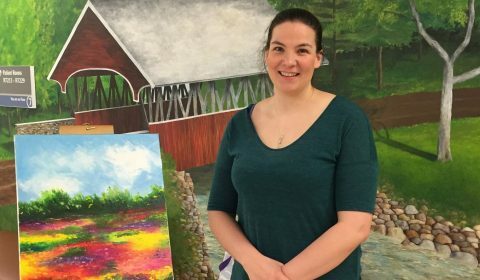 Patients have the opportunity to choose artwork that hangs in their room during their hospital stay. 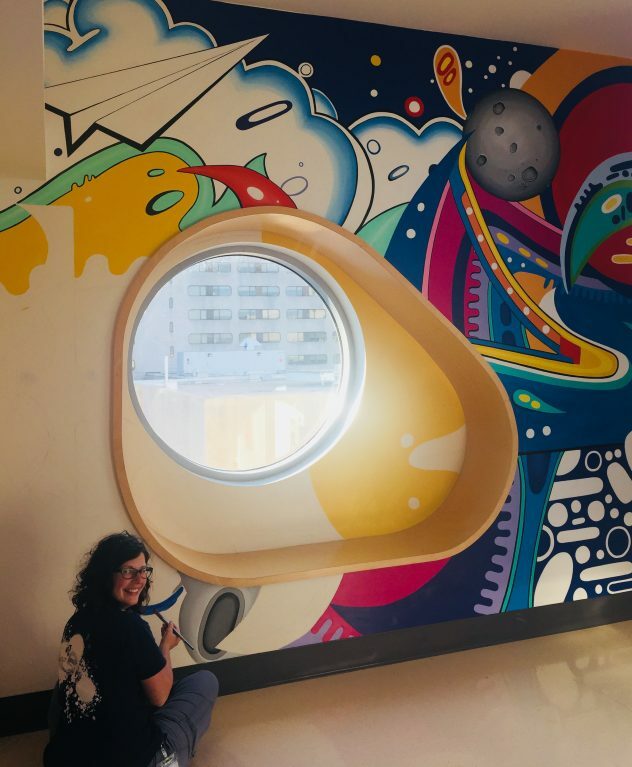 Betsy works on a mural in the Children’s Hospital. Her design is inspired by bold and youthful graffiti art. Our Coordinator for Artistic Enhancement Betsy Blyler creates murals in clinical and family areas. Summer lunchtime concert series in our outdoor courtyard, featuring local professional ensembles including jazz, classical, soft rock music and more. Check back in May for our 2018 performance schedule! 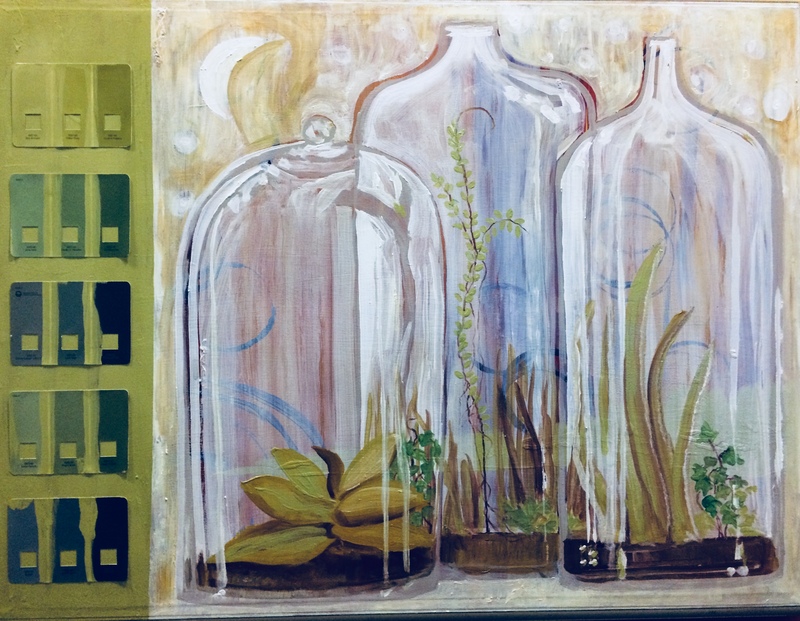 Our Public Art Committee chooses commissioned art work designed to enhance the environment of clinical and public areas. We are proud of the work that inspires our whole community and establishes a tangible connection between humanities and medicine. Take a break today and enjoy our Self-guided Art Walking Tour, click here for more details. Professional regional bands are hired to enhance special employee and staff events. Community art organizations share work created by their members. Paintings are displayed in various clinical and family areas. Artists’ work is for sale. Organized programs to harness and showcase employee and student talent in visual and performing arts. Ongoing investigations by faculty to observe, explore and quantify the impact of the arts on the patient and caregiver experience. Art therapy is for patients and families to support and improve psychological, developmental, physical, emotional, cognitive, and spiritual well-being. 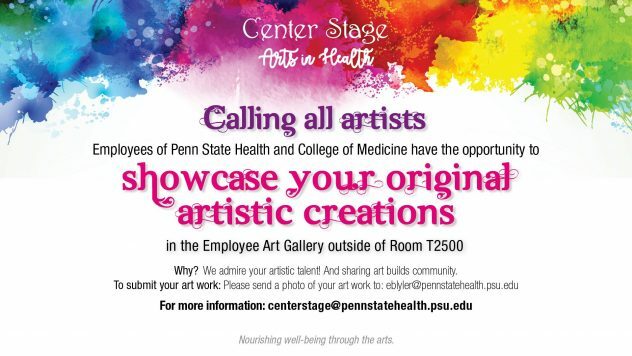 You can inspire future creative programs at Penn State Health Milton S. Hershey Medical Center and Penn State College of Medicine by making a gift to support Center Stage. Visit engage.pennstatehealth.org and click ‘GIVE TODAY’ to make a secure contribution online, or email giving@pennstatehealth.psu.edu to have a member of our Development staff contact you.